Then drove south across North Dakota, past a 65-year-old, 20' high pyramid of tin cans at Casselton to the World's Largest Catfish, a concrete structure overlooking the Red River in Wahpeton, ND. Next came Rothsay, Minnesota's World's Largest Prairie Chicken, a startling sight erected so close to the Interstate that I can't imagine a few drunks haven't driven off the road. 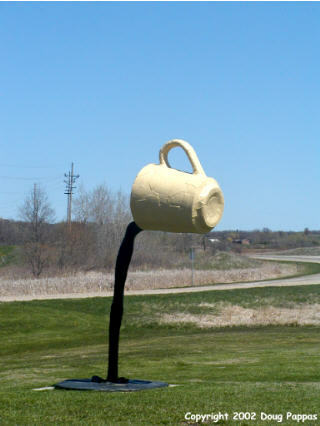 Vining, Minnesota wins the Best Ratio of Odd Sculptures to People award: 68 residents, at least eight bizarre creations, including an oversized foot with an enormous bunion, a pair of pliers with a bug caught in its grip, and a spilled cup of coffee. After passing Frazee, MN's World's Largest Turkey, it was time for the day's only "real" stop, Itasca State Park. Specifically, the headwaters of the Mississippi River, located at the north end of the park where the Mississippi flows north out of Lake Itasca. The headwaters are marked by the Shortest Bridges Across the Mississippi -- rocks which can easily be stepped across by anyone who doesn't mind getting his or her feet wet, and a plank just downstream. The Mississippi, which ultimately carries the runoff from more than a third of the continental United States into the Gulf of Mexico, descends only 1,475' during its 2,348-mile journey. That journey is 204 miles shorter than when the river was originally measured, thanks to the elimination of a large number of bends -- and would be shorter still if not for the Army Corps of Engineers, which has kept the river from bypassing New Orleans altogether in favor of a more direct route to the ocean. The water I saw leaving the lake today should reach the Gulf of Mexico in mid-August. Then it was on to Paul Bunyan country, the logging communities of central and northern Minnesota. The Bunyan legend is less than a century old, but the legendary deforester and his trusty sidekick Babe the Blue Ox have been embraced by towns from Bemidji to Brainerd. As a change of pace, Hackensack, MN displays statues of Bunyan's little-known girlfriend, Lucette Diana Kensack, and Paul Jr. William Bennett and other professional moralizers should note that no wedding license is mentioned and Lucette isn't wearing a ring. 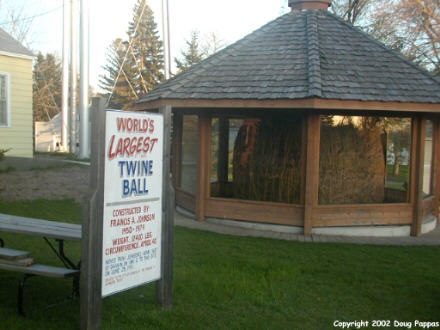 Finally, as the sun was setting, I reached Darwin, MN, home of the World's Largest Hand-Wound Ball of Twine. The Stupendous String took almost 30 years to complete, weighs over eight tons and has a circumference of about 40', and is the only roadside attraction to have inspired a Weird Al Yankovic song. (More recently, a Guinness Book of Records Museum commissioned a larger, machine-rolled twine ball, but we twine purists sneer at such pathetic attempts to simulate genuine weirdness.) Alas, the nearby Twine Ball Inn was closed for the evening. Tomorrow: the Twin Cities and Wisconsin, including the World's Largest Talking Cow.